Ontario NDP Leader Andrea Horwath and Ontario PC Leader Doug Ford are shown in a composite image. Ontario NDP Leader Andrea Horwath is laughing off concerns raised by Progressive Conservatives that her prospective cabinet would be filled with novices and radicals. Doug Ford's PCs have pounced on comments Horwath made during a Toronto Star editorial board this week after a reporter questioned if she felt she had a "thick enough bench" of people to put in charge of ministries. The reporter noted that former NDP premier Bob Rae put some inexperienced MPPs in cabinet after he unexpectedly formed government in 1990. "Training programs for the cabinet," Horwath said with a laugh. "Good training programs." 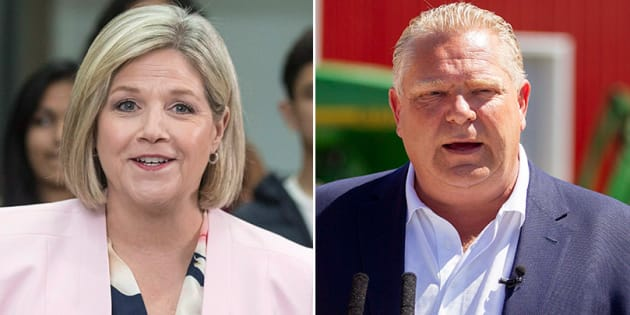 Horwath suggested to The Star she did not want to put the cart before the horse and said that she would let Ontarians make their decision. If chosen to form government, Horwath said, that would be "a problem that I'll deal with at that point." PCs released an edited video to Twitter warning that Rae's government showed that cabinet jobs are not entry-level positions. At a campaign event at Toronto's Seneca College Wednesday, Horwath was asked if the comment, which appeared to be made in jest, reflected real concerns about the inexperience of her candidates. "Not at all," she said. "In fact, my biggest concern is the Tories need to get a funny bone. They need to relax a little bit. "You all know me now. I have a sense of humour, I tend to utilize it. And that's what I did yesterday. I think maybe they should be worried about the fact that they don't have much of a sense of humour these days and we're all wondering why that might be." Opinion polls have suggested the NDP is now roughly tied with the PCs for support, leading to heightened criticism from Ford and Ontario Liberal Leader Kathleen Wynne. The PCs are targeting NDP candidates they think hold extreme positions on resource projects or other controversial views. An NDP candidate in Scarborough, for instance, has come under fire for past social media posts advancing Sept. 11 conspiracy theories. Another candidate in Mississauga has faced criticism for arguing against wearing a poppy on Remembrance Day. At a campaign event in Woodslee, Ford denied he was feeling pressure because of Horwath's good polling numbers and argued the NDP have been given a "free ride" so far on the campaign. "We're finally shedding the light on the NDP," Ford said, pointing to the party's "irresponsible" plan to close a nuclear plant in Pickering that is also being attacked by Liberals. "They aren't competent to govern. I'm just telling you the truth," Ford said of Horwath's team. "When she says she's going to have a training session, a training camp to run the province? They just don't have competent candidates." Ford said it would "actually be scary" if Horwath becomes premier. As has become the new normal, Ford bashed the economic record of former premier Rae, who went on to become a Liberal MP and persona non grata in the Ontario NDP. "Our team is ready to govern," Ford said. "We have all-stars right across the board." The NDP, however, is calling on Elections Ontario to probe the nomination contests of 12 PC candidates to determine if "any of the illegally obtained data" from the 407 Express Toll Route data breach has been used by their campaigns. Ford, a former one-term Toronto city councillor, has never served at Queen's Park. Horwath has been an MPP since 2007 and leader of her party since 2009. His own inexperience at Queen's Park became an early matter of conversation on the campaign trail when a reporter asked him to explain how a bill becomes a law in the province. Ford called it a "gotcha question" and pledged Tories would pass "endless bills" in the legislature. Ford has also faced consistent questions about the fact that he has not released a costed platform. The PC leader told reporters a platform would be released before the end of the campaign in about two weeks.